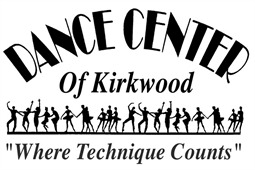 Welcome to Dance Center of Kirkwood! Please complete the following registration form. If you have questions, call Betty at (314) 821-6663. I understand that dance classes and performances may include stretching, barre work, across the floor combinations, dance routines in the center, and other related activities. I further understand that all of the activities of the dance class involve some degree of risk of strain or bodily injury. If there is a health issue that the teacher should be aware of, please inform the teacher in case she would need to modify her teaching plan. In case of illness, you may make up that class in any other class of that level. Parking: Dance Center families will now have to park in the back parking lot. Please remind and insist that your children do not wait outside for you. All dancers must wear a cover-up (street clothes) over their dance wear when coming to and from the studio. Predance 1 through Dance 3: black leotard, pink tights, pink ballet shoes, black tap shoes (ballet skirt optional), hair pulled back off the face in ponytail, bun, etc. Dance 4, Dance 5, Dance 6: black leotard, pink footed or convertible tights, pink ballet shoes. Oxford style Tap shoes, black slip-on Jazz shoes, Dance 5 & 6 Jazz and Tap classes can wear suntan tights with dance shorts. Ballet 1, 2 and 3: black leotard, pink convertible tights, ballet skirt optional, hair in a bun. Jazz and Tap 1, 2 and 3: black leotard, pink or tan tights, ballet skirt or shorts optional, black slip-on Jazz shoes, black Oxford Tap shoes. Modern 1, 2 and 3: black leotard, tan footless or convertible tights, dance skirt or shorts optional, no shoes. Due to the price increase of the new Chaminade venue, families that will participate in the June Spring Performance (recital) will now have to pay a small recital fee. Families in Predance 1 through Dance 5 will pay a $35.00 recital fees and families in Dance 6 will pay $50.. Families in Ballet, Jazz, Tap and Modern 1, 2 and 3 will pay a $75.00 recital fee. Then we will reduce the price of the recital tickets from $17 to $10.